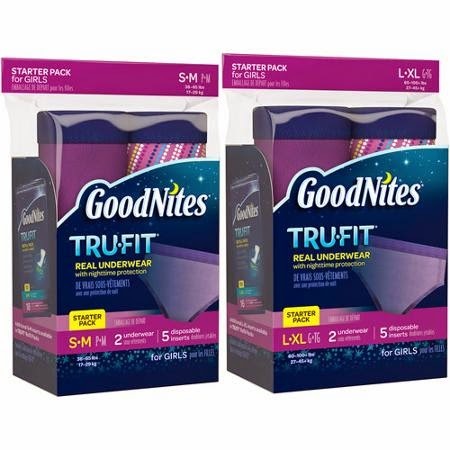 Have you heard of GoodNites* TRU-FIT*? This new underwear for boys and girls is a discrete solution for children who have lower self-confidence as a result of bedwetting! Whether at home in their own beds or at a friends enjoying a fun sleepover, GoodNites* TRU-FIT* underwear protects your child and keeps them self-assured. According to a GoodNites® brand study, it's estimated that 1 in 6 children between the ages of 4-12 in the United States suffer from nocturnal enuresis, also known as bedwetting. Research from the American Academy of Pediatrics shows that psychologically, children who wet the bed at night do not want to participate in fun activities, sleepovers at friends even, because of their fear and embarrassment. Bedwetting is a fairly common condition that a child cannot control or be trained out of, did you know that 43% of parents incorrectly believe that bedwetting can be "trained" out of a child? Another 41% of parents of bedwetters describe it as frustrating while 51% seek a better overall bedwetting product. More than one-quarter of parents express anxiety about their child spending the night away from home and wetting the bed. GoodNites® is happy to introduce a completely new kind of bedtime protection with their GoodNites* TRU-FIT* Underwear. 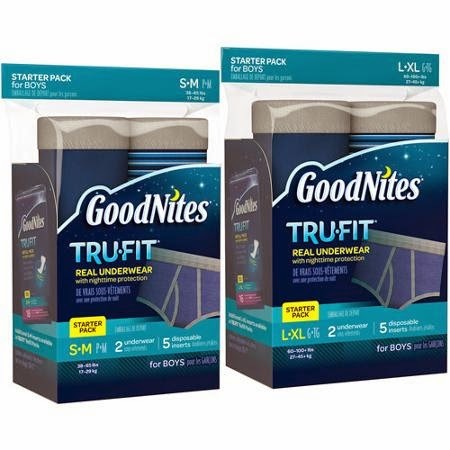 The GoodNites* TRU-FIT* are real underwear that is machine-washable, they feature a disposable, absorbent insert that help keep sheets and pajamas dry all night. This is a great new choice for parents and children who are looking for a superior bedwetting product to help enjoy a better night, every night. You can find GoodNites* TRU-FIT* available at select national retailers in sizes S/M and L/XL for boys and girls! GoodNites* TRU-FIT* Underwear is accompanied by a disposable, absorbent insert-designed to protect sheets and pajamas all night, 87% of Moms that tried the product said that TRU-FIT* will make their kids more confident. GoodNites* TRU-FIT* are easy for your child to use, the disposable, absorbent insert is easy to insert & remove, once removed, simply discard. A new insert should be used after each night's use, these TRU-FIT* Underwear really like look big boy and big girl underwear! Help your child with bedwetting by giving them GoodNites* TRU-FIT* Underwear. Are you ready to try GoodNites* TRU-FIT*? You can download a $2 off coupon HERE, GoodNites* TRU-FIT* can also be purchased at your local Walmart! Be sure to visit GoodNites® online & stay connected with them on Facebook as well as Twitter! Check out what these Moms are saying about GoodNites* TRU-FIT*! I love that they've made these more discrete! Once upon a time we had to use these for my older boys and they were not discrete at all! Great change. My oldest child never had issues with bed wetting, and my youngest is now potty training and yet to have pee-free nights. I hope we do not have bedwetting problems with him when he's a little older, but know that it is a possibility. I had not heard of these before! What a great product! I will let my sisters know about these. They are potting training their sons.